Newlands is an upmarket suburb of Cape Town, South Africa. It is located at the foot of Table Mountain in the Southern Suburbs of Cape Town, and is the wettest suburb in South Africa due to its high winter rainfall. It is home to a number of schools, notably the South African College Schools (SACS) Junior and High Schools, as well as the Newlands Forest. It is best known for Newlands Cricket Ground and Newlands Stadium, a famous rugby union and football venue. It is also the original home of Ohlsson’s Cape Breweries, which is still located next to the rugby grounds. The original Ohlsson’s Anneberg Brewery site is now location of the SACS schoolgrounds. The only remainder of the original brewery is the Josephine Mill, which used a water wheel to grind the grain for the brewery. This is now a historic monument. The pipeline from the Table Mountain spring which supplies the Newlands Brewery runs under the historic Cardiff Castle Building which is located in Newlands Village. The Liesbeek River runs through Newlands, past the Vineyard Hotel, and was the original water source used to make the first European-style beer in southern Africa. Friends of The Liesbeek maintain a walk along the river bank, past landmarks in the area. The distinctive southern half of Newlands, bordering the suburb Bishopscourt, is known as Fernwood, after a farm estate which used to occupy this area. The original manor house of this estate still exists, but is now used as a parliamentary sports club. Lion’s Head is a mountain in Cape Town, South Africa, between Table Mountain and Signal Hill. 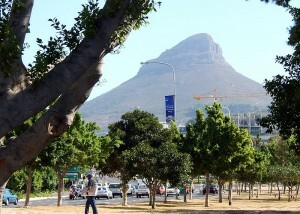 Lion’s Head peaks at 669 metres (2,195 ft) above sea level. The peak forms part of a dramatic backdrop to the city of Cape Town and is part of the Table Mountain National Park. Surrounding – The suburbs of the city surround the peak and Signal Hill on almost all sides, but strict management by city authorities has kept development of housing off the higher ground. The area is significant to the Cape Malay community, who historically lived in the Bo-Kaap quarter close to Lion’s Head. There are a number of historic graves and shrines (kramats) of Malay leaders on the lower slopes. 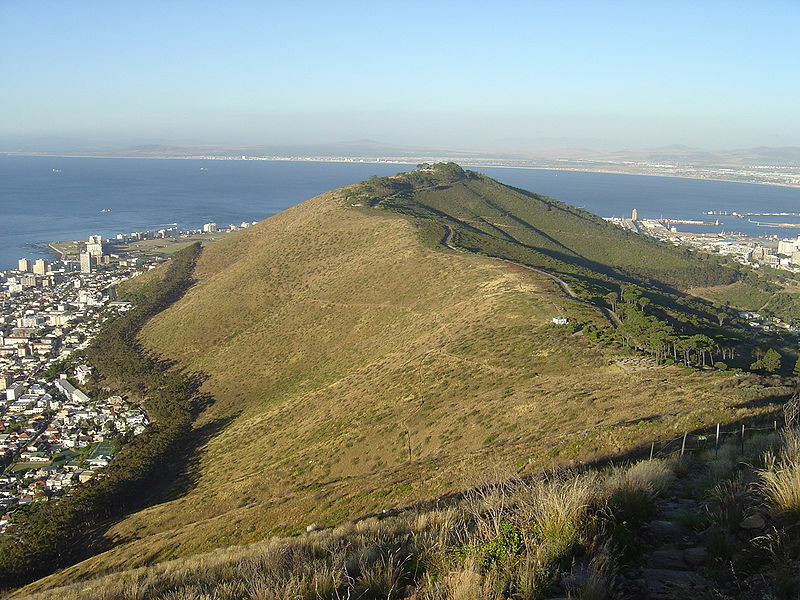 History – In the 17th century the peak was known as Leeuwen Kop (Lion’s Head) by the Dutch, and Signal Hill was known as Leeuwen Staart (Lion’s Tail), as the shape resembles a crouching lion or a sphinx. The English in the 17th Century called the peak Sugar Loaf. Activities – Lion’s Head is known for spectacular views over the city, and the hour-long walk to the top is particularly popular during full moon. Its slopes are also a popular launching point for paragliders. Geology, flora and fauna – The upper part of the peak consists of flat-lying Table Mountain sandstone and the lower slopes are formed by the Cape Granite and the Malmesbury formation, which are older Precambrian rocks. Lions Head is covered in Fynbos (indigenous Cape vegetation with an unusually rich biodiversity) and supports a variety of small animals. Three main vegetation types can be found in this, relatively small, area. All three of them are endemic to the city of Cape Town and can be found nowhere else. Most of Lions Head is covered in endangered Granite Fynbos, which fades into Peninsula Shale Renosterveld (critically endangered) on the lower slopes towards Signal Hill in the north. Right on the summit of Lions Head however, is a tiny patch of endangered Sandstone Fynbos, a different ecosystem that is also found nearby on the top of Table Mountain. Signal Hill aka Lion’s Rump, is a landmark flat-topped hill located in Cape Town, next to Lion’s Head and Table Mountain. The hill is also known as “The Lion’s Flank”, but this term is obsolete. Together with Lion’s Head, Signal Hill looks like a lion sphinx. Signal flags were used to communicate weather warnings as well as anchoring instructions to visiting ships in order to ensure that they prepared adequately for stormy weather while in the bay. Similarly, ships could use flags to signal for assistance if, for example, an anchor line parted during a storm. It is known for the Noon Gun that is operated there by the South African Navy and South African Astronomical Observatory. In 1836, a time ball was set up at the Cape Town observatory, however it was not visible to ships in the harbour, so a second time ball was erected on Signal Hill in order to relay the precise moment of 1pm Cape Mean Time. In this way ships in the bay were able to check their marine chronometers. The daily practice of dropping of the ball continued until 1934, when it was made redundant by radio signals. The guns on Signal Hill were used to notify the public when a ship was in trouble and there was a possibility of casualties on the coast near Cape Town. Three guns would be fired from Chavonnes Battery, followed by a single gun in answer from Imhoff Battery. There is a road to the summit and that vantage point provides spectacular views over Cape Town and surroundings, especially at dawn or sunset. Along Signal Hill Road one can also find the Appleton Scout Campsite owned and operated by the South African Scout Association. Signal Hill is one of the only places in the world where critically endangered Peninsula Shale Renosterveld vegetation can be found. Peninsula Shale Renosterveld used to be the dominant ecosystem of the Cape Town City Bowl, but was completely endemic – occurring nowhere else in the world. Urban growth has now covered most of this ecosystem and – along with a tiny patch on Devil’s Peak – Signal Hill has the only surviving sample of this vegetation in the world. Table Bay (Afrikaans Tafelbaai) is a natural bay on the Atlantic Ocean overlooked by Cape Town (founded 1652) and is at the northern end of the Cape Peninsula, which stretches south to the Cape of Good Hope. It was named because it is dominated by the flat-topped Table Mountain. Bartolomeu Dias was the first European to explore this region in 1486. The bay, although famous for centuries as a haven for ships, is actually a rather poor natural harbour and is badly exposed to gales from both the SE and NW. Many sailing ships seeking refuge in the bay during the 17th and 18th centuries were driven ashore by storms. (See article about Wolraad Woltemade). 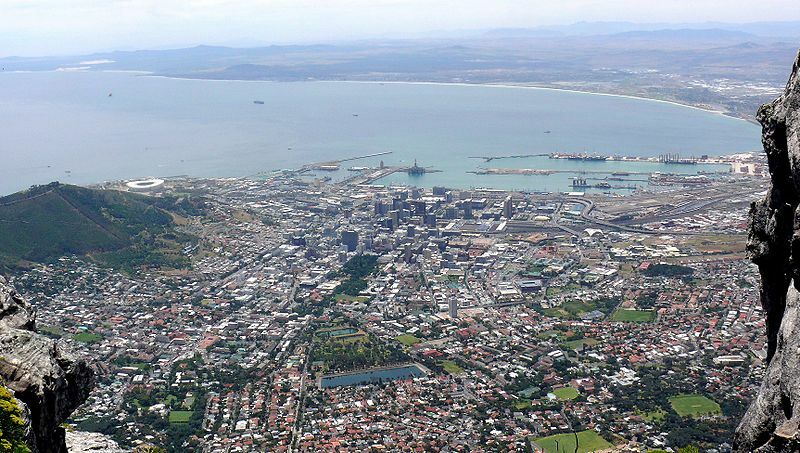 The Dutch colonists nevertheless persisted with their colony on the shores of Table Bay because natural harbours along this coastline are scarce and the only realistic alternatives- Simon’s Bay and Saldanha Bay – had almost no fresh water. Eventually a harbour was built in Table Bay by a process of land reclamation and defended by breakwaters to protect shipping. The older part of this structure is called the Victoria Dock. The newer part is called the Duncan Dock. The blue indentation that is the harbour and the white line of the breakwater are just visible in the satellite image. Robben Island, where Nelson Mandela was imprisoned for decades, is in this bay. Grabouw is a mid-sized town located in the Western Cape province of South Africa some 65 km south-east of Cape Town along the N2 highway. It is located over Sir Lowry’s Pass from Somerset West in the Elgin Valley, which is sandwiched between the Hottentots-Holland, Kogelberg and Groenland Mountains, with the valley floor still being substantially hilly. Grabouw is the commercial centre for the Elgin Valley, the largest single export fruit producing area in Southern Africa. The town’s population at last census stands at 15,993. History – The town was created on the farm “Grietjiesgat”, owned by a man called Willem Langschmidt, who started the community around his wife’s little trading store. Langschmidt named the village after the German town Grabow where he was born. Later, the Molteno family began to buy land in the area – principally two brothers who eventually turned the surrounding region into Southern Africa’s largest single export fruit producing area. They were influential in developing the town, for example donating the land for the town’s railway station. Another influential resident Edmond Lombardi created an apple-juice drink he called “Appletiser”, on his nearby farm Applethwaite, and introduced it to the market in 1966. Economy – The town’s economy is based on servicing the surrounding agricultural industry, with the Elgin Valley being intensively used for viticulture and the cultivation of apples, pears, plums and other deciduous fruit. The Elgin Valley produces 65% of South Africa’s apple exports. One of the biggest factories in Grabouw is Appletiser which provides the popular Appletiser soft drinks. Altogether, this has earned it the reputation worldwide as the “valley of apples”. Tourism is also of importance to the economy. The N2 highway through the valley is extremely busy during the holiday season. Attractions – Situated by the Palmiet river in the fertile Elgin valley, Grabouw is surrounded by the Hottentots Holland mountains to the north and the Kogelberg Biosphere Reserve to the south. There is wine and cider tasting on the surrounding farms and several routes for exploring the surrounding mountains begin from the town. There is also the annual Elgin Festival, which takes place on the last week-end in October and boasts a wide range of flower displays, fruit, wines and a great variety of local products. Within the town, the Elgin Apple Museum is one of the oldest remaining buildings in Grabouw. It is situated on the banks of the Palmiet River. The Museum depicts the history of the fruit industry in the region. The nearby Grabouw Country Club has scenic views overlooking the Eikenhof dam and pine covered mountains. Applethwaite Farm and Church, was built in the early 1960s by Edmond Lombardi, the founder of Appletiser. The church was built for the use of the farming community and is interesting because of the Italian marbles and wood carvings of the Stations of the Cross. Climate – The town experiences a very mild Mediterranean climate, more moderate than most other Western Cape locales, with abundant rainfall, mostly in the winter months, although strong summer south-easterly winds can sometimes bring squalls. This wind is known as the “Black South-Easter” for its gusting winds and showers. Robben Island (Afrikaans Robbeneiland) is an island in Table Bay, seven kilometres off the coast of Cape Town, South Africa. The name is Dutch for “seal island”. Robben Island is roughly oval in shape, 3.3 km long north-south, and 1.9 km wide, with an area of 5.07 km². It is flat and only a few metres above sea level, as a result of an ancient erosion event. The island is composed of Precambrian metamorphic rocks belonging to the Malmesbury Group. It is of particular note as it was here that future President of South Africa and Nobel Laureate Nelson Mandela and future South African President Kgalema Motlanthe, alongside many other political prisoners, spent decades imprisoned during the apartheid era. Current South African President Jacob Zuma was also imprisoned there for ten years. Since the end of the 17th century, Robben Island has been used to isolate certain people — mainly political prisoners. Its first prisoner was probably Harry die strandloper in the mid-17th century. Amongst its early permanent inhabitants were political leaders from various Dutch colonies, including Indonesia. After a failed uprising at Grahamstown in 1819, the fifth of the Xhosa Wars, the British colonial government sentenced African leader Makanda Nxele to life imprisonment on the island . He drowned on the shores of Table Bay after escaping the prison. The island was also used as a leper colony and animal quarantine station. Starting in 1845 lepers from the Hemel-en-Aarde leper colony near Caledon were moved to Robben Island when Hemel-en-Aarde was found unsuitable as a leper colony. Initially this was done on a voluntary basis and the lepers were free to leave the island if they so wished. In April 1891 the cornerstones for 11 new buildings to house lepers were laid. After the introduction of the Leprosy Repression Act in May 1892 admission was no longer voluntary and the movement of the lepers was restricted. Prior to 1892 an average of about 25 lepers a year were admitted to Robben Island, but in 1892 that number rose to 338, and in 1893 a further 250 were admitted. In the 2009 South African General Election, the Democratic Alliance won the island. Robben Island and nearby Whale Rock have been the nemesis of many a ship and its crew. The surf of the open Atlantic Ocean thunders continuously at its margins and any vessel wrecked on the reefs offshore is soon beaten to pieces and disappears. In the latter half of the 17th century a Dutch ship laden with gold coins earmarked for the payment of the salaries of employees of the Dutch East India Company in Batavia (now Jakarta, Indonesia) disintegrated on these reefs a short distance offshore, in relatively shallow but very restless waters. The gold today would be worth tens of millions of pounds sterling or U.S. dollars. A few coins have washed ashore over the centuries but the treasure itself remains in the ocean. It is protected largely by the almost ceaseless and violent surf. Many other vessels have been wrecked around the island. Jan van Riebeeck first set a navigation aid atop Fire Hill (now Minto Hil,), the highest point on the island. Huge bonfires were lit at night to warn VOC ships of the rocks that surround the island. The current Robben Island lighthouse, built on Minto Hill in 1864, is 18 metres (59 ft) high and was converted to electricity in 1938. It is the only South African lighthouse to utilise a flashing light instead of a revolving light. Its light is visible for 24 nautical miles. The Moturu Kramat, a sacred site for Muslim pilgrimage on Robben Island, was built in 1969 to commemorate Sayed Abdurahman Moturu, the Prince of Madura. Moturu, one of Cape Town’s first imams, was exiled to the island in the mid-1740s and died there in 1754. Muslim political prisoners would pay homage at the shrine before leaving the island. When the Dutch arrived in the area in 1652, the only large animals on the island were seals and birds, principally penguins. In 1654, the settlers released rabbits on the island in order to provide a ready source of meat for passing ships. The original colony of African Penguins on the island was completely exterminated by 1800. However the modern day island is once again an important breeding area for the species after a new colony established itself there in 1983. The colony has grown to 13,000 and is now the third biggest for the species. The penguins are easy to see close up in their natural habitat and are therefore a popular tourist attraction. “ My father, a naval officer at the time, with the sanction of Doctor Hey, director of Nature Conservation, turned an area into a nature reserve. A ‘Noah’s Ark’ berthed in the harbour sometime in 1958. They stocked the island with tortoise, duck, geese, buck (which included Springbok, Eland, Steenbok, Bontebok and Fallow Deer), Ostrich and a few Wildebeest which did not last long. All except the fallow deer are indigenous to the Cape. Many animals are still there including three species of tortoise—the most recently discovered in 1998—two Parrot Beaked specimens that have remained undetected until now. The leopard or mountain tortoises might have suspected the past terror; perhaps they had no intention of being a part of a future infamy, but they often attempted the swim back to the mainland (they are the only species in the world that can swim). Boats would lift them out of the sea in Table Bay and return them to us. None of the original 12 shipped over remain, and in 1995, four more were introduced—they seem to have more easily accepted their home as they are still residents. One resident brought across a large leopard tortoise discovered in a friend’s garden in Newlands, Cape Town. He lived in our garden and grew big enough to climb over the wall and roam the island much like the sheep in Van Riebeeck’s time. As children we were able to ride his great frame comfortably, as did some grown men. The buck and ostriches seemed equally happy and the ducks and Egyptian Geese were assigned a home in the old quarry, which had, some three hundred years before, supplied the dressed stone for the foundations of the Castle; at the time of my residence it bristled with fish. There may be 25,000 rabbits on the island; they are being hunted and culled to reduce their numbers. The Cape Winelands is a region of the Western Cape Province of South Africa. It is the largest wine producing region in South Africa and is divided into six main wine regions, each offering their own unique wine route. Constantia, Stellenbosch, Franschhoek, Paarl, Robertson and Wellington are the most popular. The geographic area is generally referred to locally as the Boland, meaning uplands in Afrikaans. Constantia Valley wine region is situated in mountainous surroundings, and boasts some of the oldest wine estates and homesteads along with several award winning wines and restaurants. 90% of the farms offer wine tastings and cellar tours. Stellenbosch wine region is the best known in the Cape. In 1971 the first official wine route was founded by Frans Malan of Simonsig, Spatz Sperling of Delheim, and Niel Joubert of Spier. It is home to a variety of cellars producing some of the country’s most acclaimed wines. Simonsig, Boschendal, Neethlingshof, Delheim, Welmoed, Delair, Spier, Saxenburg, Asara, Blaauwklippen, Warwick, Kanonkop, De Trafford, Thelema, Niel Ellis, Rust en Vrede, Dornier, Watwerford and De toren, to name a few. Franschhoek valley wine region was settled over 300-years ago by the French Huguenots. Set against the backdrop of the Franschhoek and Drakenstein mountains, this quaint village has over 30 wine farms: Akkerdal Estate, Allée Bleue Farms,Bellingham, Boekenhoutskloof, Boschendal Cabriere, Chamonix, Dieu Donné, Eikehof, Franschhoek Pass Winery, Franschhoek Vineyards, Freedom Hill wines, GlenWood, Graham Beck cellar, Grande Provence, Haut Espoir, La Bourgogne, La Bri, La Chataigne, La Chaumiere Wine Estate, La Couronne Wine Estate, La Motte, La Petite Ferme, La Roche, Landau Du Val Wines, Le Manoir de Brendel, Lormarins, Lynx Wines, Mont Rochelle Mountain Vineyards, Moreson, Plaisir de Merle, Rickety Bridge Winery, Rupert & de Rothschild Vignerons, Solms, Stony Brook, Vrede en Lust. A number of other excellent wine farms can be found in the Paarl and Wellington regions. The Victoria & Alfred Waterfront in the historic heart of Cape Town’s working harbour is South Africa’s most-visited destination, having the highest rate of foreign tourists of any attraction in the country. 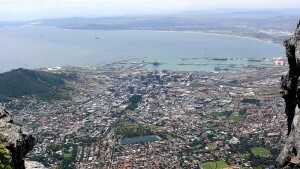 Situated between Robben Island and Table Mountain and set against a backdrop of sea and mountain views, it offers a variety of shopping and entertainment options to visitors, intermingled with office locations, the Somerset Hospital, hotels (such as the historical Breakwater Lodge – once a 19th century prison) and luxury apartments in the residential marina. It houses the Nelson Mandela Gateway which offers boat trips to Robben Island, as well as the Two Oceans Aquarium and Chavonnes Battery museum. The SAS Somerset is used as a museum and moored within the inner basin.